I was kind of surprised to receive an email recently with the question, "What is a Joget Workflow app?" I had thought that we would have published enough information on our website and community knowledge base explaining what it is. 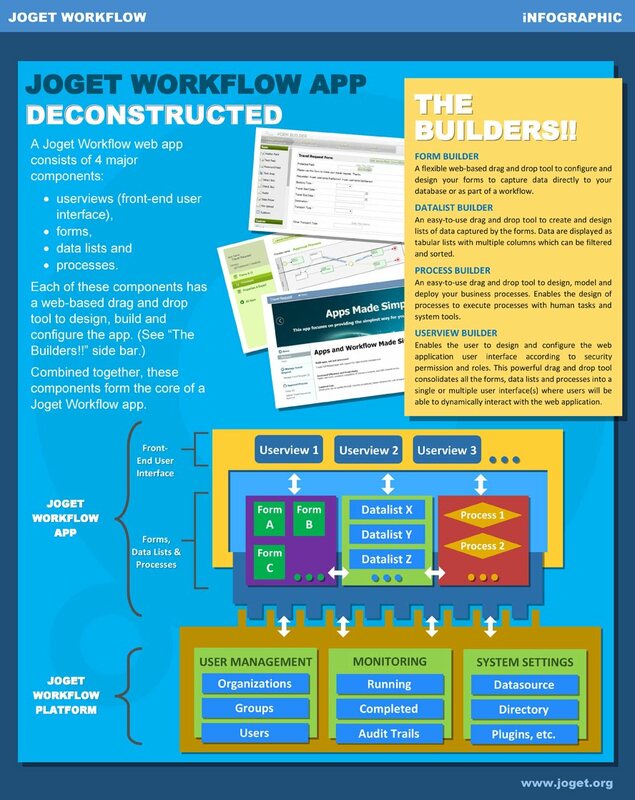 After searching and crawling through our sites, the only reference I could find that explained what a Joget Workflow app is, was in another blog post titled, "Web App Development Methodology for The Citizen Developer (Infographic)". We were so careful in taking care of the tree that we forgot about the forest. Ouch! Our bad! So here is an explanation with some recycled information. What is a Joget Workflow App? A Joget Workflow App is a web application that is built and developed on the Joget Workflow platform to run on the Joget Workflow platform. At its core, the app consist of 2 XML definition files (app and process definition). These definition files are what the platform needs to render the app in an easy-to-use form. From the user perspective, a deconstructed Joget Workflow App consist of 4 components - forms, data listings, user interface and processes. Combined together, each of these components plays an integral part that enables the web application to function cohesively on the platform. The platform allows the developers to use the builders tools (refer to above Infographic) to design and build these components in a systematic manner producing the final application. The following video introduce the Joget Workflow Apps and the App Center. In v4, the introduction of the App Generator has allow developers to greatly accelerate the development of app prototypes or minimal viable product for user feedback and testing. Watch the following "Joget Workflow v5 Introduction Tutorial" video to see the new App Generator in action. Next, explore the Joget Workflow knowledge base or Marketplace to download free apps to use as templates or tutorials.